When Adele De Bondi was 20 weeks pregnant during a routine ultrasound doctors noticed that her baby was only about 17 weeks in size. They gave her a course of steroids in hopes of stimulating the baby’s growth, but her placenta was dying, taking with it – the baby. Undeterred by the prognosis, Ms De Bondi demanded a caesarean section despite the risks of losing not only her child but her fertility and her own life. 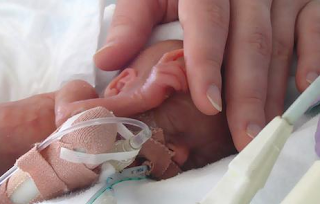 Elora was born after only 24 weeks in the womb. Elora De Bondi’ was born on January 29 weighing 319 grams, making her possibly the smallest baby born alive in Australia. Her arms barely spanned the length of her mother’s finger. Before she was delivered 16 weeks’ premature, doctors at the Royal Women’s Hospital doubted she would live. But her mother, Adele, even after being told by doctors that they held no hope, never lost her own hope. Elora spent seven months in intensive care attached to ventilators and came close to dying countless times. She battled infections, renal failure and the stress of her surroundings. Many times doctors advised Ms De Bondi to switch off Elora’s life support. Her mother remained steadfast, trusting that her fragile daughter, who she had barely touched, would pull through.After months in a critical condition, Elora grew to 4.4 kilograms. She left hospital on August 27, astounding doctors with her survival. Elora’s pediatrician said her story was “miraculous but the journey is long and uncertain for extremely tiny babies”. “Families, and the staff who care for such premature babies, have faced the most difficult decisions of survival and quality of life,” said Sue Jacobs, director of the Royal Women’s neonatal services. Before Elora, the smallest surviving baby at the Royal Women’s was Adriana Cassar, born 13 weeks premature, at 374 grams, eight years ago. Elora faces many hurdles. She is fed through a gastronasal tube and her immune system is weak. While her lung disease is expected to clear in childhood, doctors will wait at least two years before giving the all-clear. Every time I read one of these stories it makes me realize that you can’t underestimate the power of a micro-preemie. I also hope that it shows parents who are currently in this situation that you have to believe that your baby can be far more than doctors think they can be. I hear of too many parents disconnecting their preemies because of long term health fears. Not all babies make it out with nothing wrong, but most parents of special needs children will tell you that their child has taught them a new way to look at life. Just Found Your Article and i just want to add that life has its miracles, Our daughter was born 4 Months Early and she is doing Fantastic, All her health Checks are coming back with good results and she has no effects from her early birth. She is now 19 Months old and is doing just Fine. Please Take a Look at My Page On Youtube if you like as we were celebrities in February When Charlie Jo Came Home.